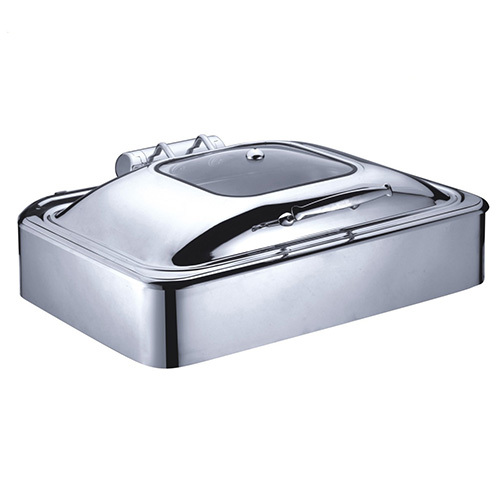 Prepare and present hot food in style at your buffet, catered event, or temporary serving station with this 6 quart round induction chafer. This attractive and functional chafer eliminates the need for chafer fuel, fitting directly onto induction cookers to keep your food hot with maximum efficiency. A rear stabilizing leg offers excellent balance during use. With its mirror-polished stainless steel body and chrome-plated handle, this chafer has a simple but sophisticated look that makes it suitable for any occasion. The glass top provides visual interest to attract hungry patrons, while giving you a window to monitor your culinary creations. 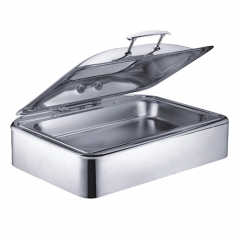 Additionally, a slam-resistant lid mechanism ensures gentle closings every time.